NASHVILLE, Tenn.—Most Protestant senior pastors say their church is open to hearing about racial reconciliation. While 45 percent have preached on racial reconciliation in the last three months, few pastors have been criticized for speaking about race. Five percent say they’d received negative feedback for addressing racial reconciliation from the pulpit in the last two years. Eighty-four percent received no negative feedback. Ten percent haven’t spoken about the topic. Yet few churches seem enthusiastic about discussing issues of race, according to their pastors. About three-quarters of pastors (73 percent) say they have not been urged by church leaders to preach about reconciliation. About a quarter (26 percent) have been urged to preach on the issue. Responses varied by denomination. And at times, a pastor’s impressions of their church and their church’s actions were at odds. Baptist (92 percent) and Pentecostal (93 percent) pastors, for example, are more likely to say their church would welcome a sermon on reconciliation. However, they’re less likely to have been asked by church leaders to preach on the topic. Only about 1 in 5 Baptist (17 percent) or Pentecostal pastors (20 percent) have been urged to address reconciliation. By contrast, Presbyterian/Reformed pastors are likely to say their churches are open to sermons on reconciliation (92 percent) and more likely than other denominational pastors to have been urged to preach on the topic (37 percent). Overall, mainline pastors are more likely to have been urged to preach on racial reconciliation than evangelical pastors (38 vs. 22 percent). Age also played a role in whether or not pastors had preached on racial reconciliation. Pastors age 65 or more are least likely to have preached on racial reconciliation in the last quarter (32 percent) and least likely to have been urged to preach on it (18 percent). 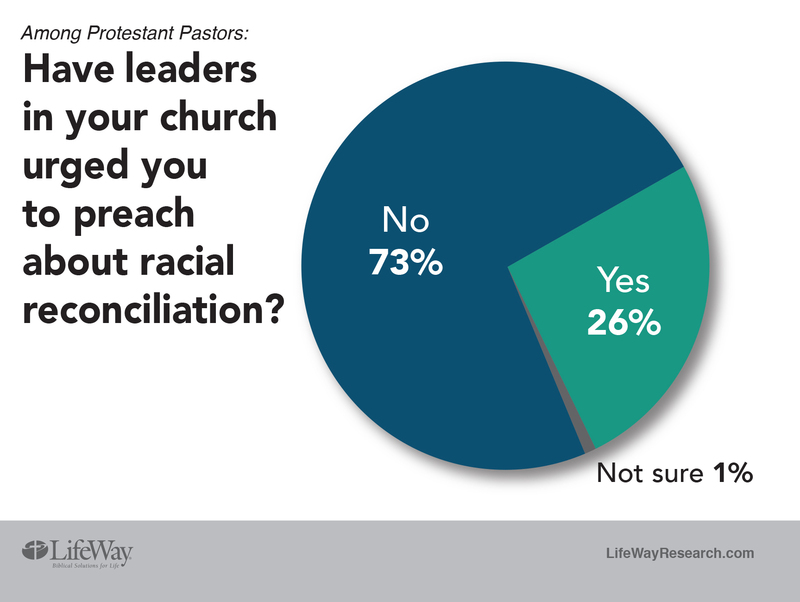 The new LifeWay Research study found that pastors report taking a number of personal steps when it comes to racial reconciliation. Meals with people from other ethnicities are most common. Almost three-quarters (72 percent) of Protestant pastors say they’ve had a meal with a diverse small group of people (less than 10) in the last month. That includes 44 percent who say they’ve had a meal in the last week with a small group that included someone of another race. About 4 in 10 white pastors (42 percent) say they’ve had a meal in the past week with a diverse group. So do 52 percent of African-American pastors and 60 percent of pastors of other ethnicities. The portion of pastors who say they’ve had a meal with a diverse group in the past week varies by denomination. Baptist (46 percent), Methodist (48 percent) and Pentecostal (50 percent) pastors were more likely, while Presbyterian/Reformed pastors (34 percent) were less likely. 57 percent of Protestant senior pastors spent time socializing with neighbors of other ethnicities. 53 percent led times of corporate prayer for racial reconciliation. 51 percent discussed reconciliation with church leaders. 45 percent preached on racial reconciliation. 40 percent met regularly with pastors of other ethnicities. 31 percent invested church funds in changing local economic inequalities. 20 percent led a public lament over racial unrest or injustice. Previous LifeWay Research studies have found questions of racial reconciliation and diversity take a back burner at many Protestant churches. A 2015 report among churchgoers found more than half (53 percent) disagreed with the statement, “My church needs to become more ethnically diverse. Forty percent agreed. Seven percent disagreed. Two-thirds (67 percent) said their church had done enough to become diverse. That study also found churchgoers who oppose more diversity do so with gusto. A third (33 percent) strongly disagree that their church needs to be more diverse. More than 4 in 10 (42 percent) felt strongly their church was doing enough. Evangelicals (71 percent) are most likely to say their church is diverse enough, compared to non-evangelicals. And white churchgoers (37 percent) are least likely to say their church should become more diverse, compared to other ethnicities. A 2014 study found most Protestant pastors believe every church should strive for racial diversity (85 percent) and that “churches should reflect the racial diversity in their community” (91 percent). Yet most (86 percent) also said their congregation is predominantly one racial or ethnic group. The phone survey of Protestant pastors was conducted Aug. 22 – Sept. 16, 2016. The calling list was a stratified random sample, drawn from a list of all Protestant churches. Quotas were used for church size. Each interview was conducted with the senior pastor, minister or priest of the church called. Responses were weighted by region to more accurately reflect the population. The completed sample is 1,000 surveys. The sample provides 95 percent confidence that the sampling error does not exceed plus or minus 3.2 percent. Margins of error are higher in sub-groups.